Wed., June 1, 2016, 10:46 p.m.
SAN DIEGO – No gentle way to put this. 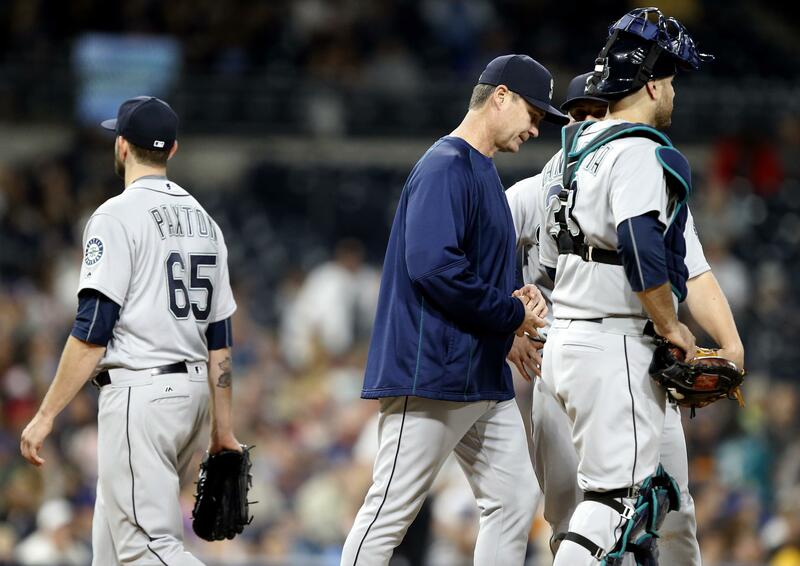 James Paxton’s return Wednesday night to the big leagues was a disaster. A crushing disaster. And a wasted opportunity in an 14-6 roll-over loss to a reeling opponent. The Mariners recalled Paxton from Triple-A Tacoma to start against the San Diego Padres after a strained right calf forced Felix Hernandez to the disabled list. Robinson Cano then hit a three-run homer in the first inning that provided Paxton with an early cushion. Everything was set up for an easy night, and then everything went wrong. Paxton gave up six runs in the first inning…six runs to an opponent that ranked 28th in scoring among the 30 clubs. Paxton fueled this mess with a costly throwing error on a play that could have gotten him out of the inning with a 3-1 lead. Paxton (0-1) threw 103 pitches in just 3 2/3 innings while allowing eight runs and 10 hits. The Mariners then turned to Joel Peralta, whose struggles continued when he gave up four more runs in 1 1/3 innings. Then it was Steve Johnson’s turn to get roughed up for three runs in his only inning. Johnson had not allowed a run over 10 1/3 innings over his nine previous appearances. The Padres hit four homers, including two by Alexei Ramirez, who entered the game with one. Ramirez also had five RBIs. Wil Myers and Adam Rosales also hit homers. John Jay had four hits. Myers and Yangervis Solarte each had three. The Padres finished with 19. But the game turned in a wild first inning that, for the Mariners, started with such promise. Nori Aoki opened the game by working back from an 0-2 hole for a nine-pitch walk against Padres starter Christian Friedrich. Franklin Gutierrez followed with a single before Cano turned on a first-pitch fastball. Friedrich (2-1) had yielded just three runs combined in his three previous starts. The Mariners had a chance for more when they loaded the bases with one out, but Luis Sardinas popped out, and Paxton took a third strike. The Padres began their comeback when Myers launched a one-out homer, on the last of four straight fastballs, over the right-field wall. Matt Kemp and Solarte followed with singles, which put runners at first and third with one out and set up the decisive moment. Melvin Upton hit a potential double-play grounder back to the mound, but Paxton threw the ball into center field. One run scored, making it 3-2, and the Padres still had runners at first and third with one out. After Upton stole second base without a throw, Derek Norris tied the game with a sacrifice fly to center. San Diego took the lead on Ramirez’s RBI single to right before Adam Rosales hit a two-run homer to left. What had been a three-run lead was now a three-run deficit. A long night was just beginning. The Padres had runners at first and third with one out when Melvin Upton hit an easy one-hopper back to the mound. It should have been an inning-ending double play. Instead, Paxton threw the ball well wide of second baseman Robinson Cano and into center field. One run scored on that error, and San Diego scored four more runs before the inning ended. PLUS: Robinson Cano’s homer in the first inning extended his streak of reaching base at least once to 30 games, which is the longest current streak in the majors…Kyle Seager had four hits and raised his average to .287…Nick Vincent pitched a one-two-three inning with two strikeouts. MINUS: The end could be nearing for veteran reliever Joel Peralta, who gave up three runs in 1 1/3 innings. His ERA is up to 5.40 after giving up 10 runs and 16 hits in his last nine innings…Dae-Ho Lee opened the third inning by one-hopping a drive off the left-field wall. Melvin Upton played the carom perfectly, and Lee threw on the brakes between first and second. But he couldn’t get back safely. Published: June 1, 2016, 10:46 p.m.